Ikebana is the Japanese art of flower arrangement. It is a traditional form of flower art that is enjoyed even on a daily basis by many people both in Japan and around the world. Ikebana or kado ("the way of the flowers") is an original form of Japanese art that involves an arrangement of a variety of plants. Kado and Ikebana are technically the same. However, the term Kado refers not only to the beauty of the flowers but also requires manners, techniques, mental and physical training as well. It is considered to be one of the ”ways” of the Japanese beliefs. Therefore, a work of the Kado is referred to as ”Ikebana flower arranging” and specialists of the ways of the Kado are called ”Kado-ka” (flower masters). For ages, many Kado-ka has been developing the skills of Ikebana in order to create techniques to arrange flowers in a beautiful way. Due to this, there are many schools of Ikebana. It is not an easy task to comprehend and know all the schools. In this article, we will introduce you to the basics of the world of Kado and Ikebana. Unfortunately, there are no records on how or when Kado or Ikebana came to be, however, it is said to derive from Buddhism. One theory says that floral tributes offered to Buddha or the dead are the roots to Kado. The representative of the school that succeeds the tradition of the Kado is generally referred to as the ”iemoto”. The oldest iemoto and the first head of the Ikenobo school was Senkei Ikenobo who was also a monk. This is how you can see that Kado had a connection to Buddhism in some way. Currently, it is said that there are over 300 schools of Kado. Out of all of them, the main three schools that represent Japan are the Ikenobo, Sougetsu school, and the Ohara school. The culture of Ikebana spread throughout Japan and later became known in Europe around the end of the Edo period as well. Unlike the Western style of flower arranging, the different methods of Kado-Ikebana influenced many people outside of Japan. Like other forms of art, it is important to appreciate its beauty according to your senses. That way you will understand the way the Japanese treat the seasons along with the sense of beauty. It is something you can understand without words. However, like mentioned previously, Ikebana is not just a form of art where plants are arranged to look pretty. Being able to honor and respect nature and understanding the heart of the artist will allow you to enjoy the works of art even more. 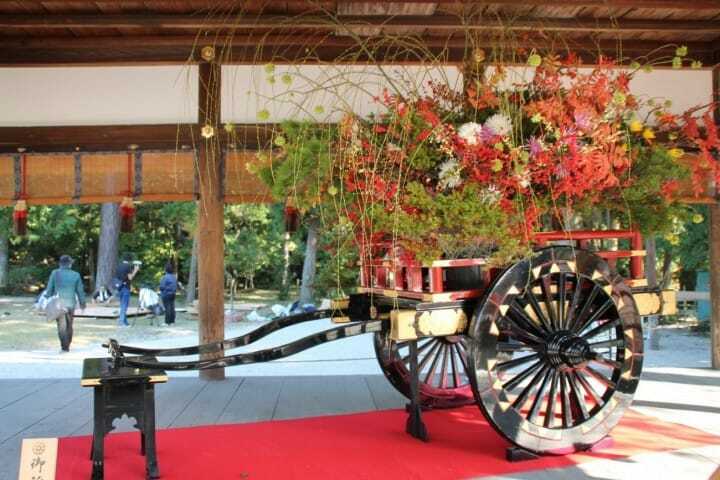 In some events, you would be able to watch a Kado master arrange flowers on the spot. If you manage to catch this opportunity, observe the master's movements and the techniques applied during the process. How Are Ikebana Arrangements Made? Ikebana was originally made to be placed in the tokonoma area of the Japanese room. Therefore, arrangements were made to be seen only from the front, though, lately, Ikebana can be seen in museums and various galleries. Therefore, techniques and methods with more flexibility have been applied to suit the location (Note: rules and techniques vary by the school). Despite the differences, all schools use the flower scissors to cut the plants and create a balanced arrangement in a flower vase. How Can Tourists Enjoy Ikebana? Visitors from outside of Japan can experience the world of Ikebana at exhibitions held at galleries and major department stores around the nation. With the increase of visitors from abroad, many travel and tour agencies have been providing programs for people to experience Ikebana. If you search for ”Ikebana experience”, you should be able to find the information you would need. One of the schools of Kado, the Ikenobo has information available in English on their website. Please check their site if you would like more information. For those who would like to experience other Japanese cultural activities, please read Experience Kabuki, Sumo, Tea Ceremony and Other Traditional Activities.